Either the size or label column in Excel is needed to copy and paste the gradation into Excel. You can delete or hide the label column. Column headings are not required to paste from Excel. Paste from Excel also accepts text. You can paste from a word document (tab spacing) or text file as long as the data is formatted correctly. 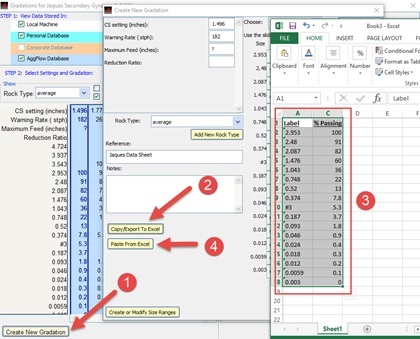 If the workbook does not open, you can open a blank workbook and use the Excel paste function, the gradations will be on the clipboard. As long as the table is set up correct, you can copy paste from Excel directly. Under Database, Use the View Screen Size Conversion Table to see the available labels for mesh sizes for the user preference selected. Use Paste from Excel to enter the gradation in AggFlow, the new gradation is shown and select ‘Yes’. For Feed, remember to change the Feed Name, and the density as required. Use Add Group to add a new Specification Group, later you can copy the specification to your new group, the group will be at the bottom of the list when it is created. Set up the new specification and copy the Label, %Pas. min and %Pas. max columns, you can hide the Size column. Specifications will be pasted into the selected group, it can then be moved to another group.